Geneva Gare Cornavin train station, often simply called Cornavin, is Geneva's central railway station, located in the north-western part of the city, only 1 stop by tram or 5 minutes walking to the very city center (Bel-Air). Gare Cornavin Railway station was recently renewed and looks very modern, clean and tidy. The airport is only 1 train stop (8 minutes) away. By fast and always on-time swiss trains, from here you can get a connection to any other Swiss or European city. 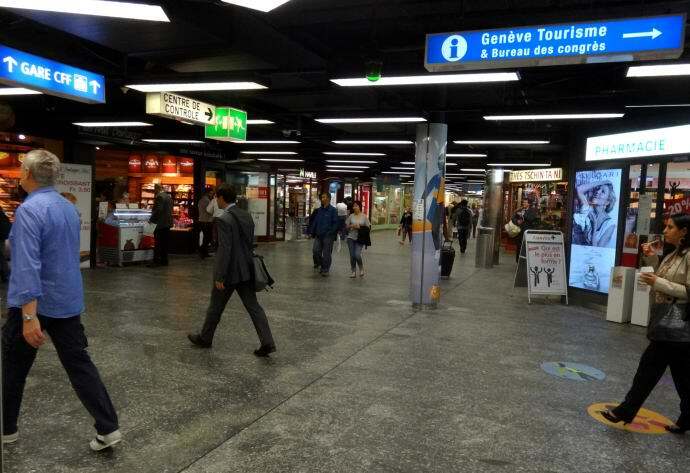 Geneva Central Train station, open nonstop, provide travelers with various restaurants, cafes, fast foods, shopping malls, grocery store (Migros), lockers and parking opportunities. Many hotels surround the Cornavin station. Gare Cornavin is a hub of public transport. Many trams and buses stop at Gare Cornavin: 1, 3, 5, 8, 9, 14, 15, 18, 25, 27, 61, F, V, Z. 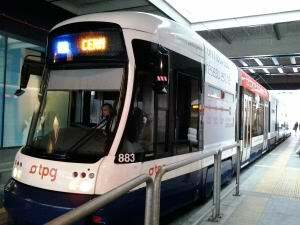 Train to/from the Airport goes every 12-20 minutes (12 minutes in rush hours) from/to Gare Cornavin Railway Station (platform 3, electricity in a coupes) and it is just an 8 minutes journey. Bus number 5 is going from Cornavin to Airport every 30 minutes. The journey takes 20 minutes. The advantage compared to train is that bus stops directly at the Airport Terminal, while from airport train station there is a 5 minute walk through shopping area to the terminal. The ticket price is 3.0 CHF (valid for 1 hour; for bus, tram, train and boat). If you are coming to Geneva by airplane, at the machine at the luggage hall you can get a free public transport ticket, valid for 80 minutes from the time of printing the ticket by the machine. Have a look at Gare Cornavin Departures Timetable for arrival and departure times for Gare Cornavin. It's very easy to find a route on the official website, where You can also buy a ticket online. Underneath the station is a huge parking lot with 900 places. In between 2013 - May 2014 the eastern part of the train station underwent the general reconstruction and now the shopping and public area was extended and much more space and ticket machines were added to previously overcrowded station. The station took a modern, airy look. Migros grocery store with standard food sortiment and huge queues, exceptionaly open 365 days a year until 10pm; Starbucks Coffee just above it; bookstore; Fluriot flower market; Eden Baisshop; Body Shop and many more boutiques and newspaper stalls such as Relay. Station shopping METRO SHOPPING CORNAVIN with over 60 shops like Gex, H&M, Jeans & Co, Calvin & Klein, Tissot Swiss Watches, Swarovski, Iver Rocher, Pharmacy, Cafes and Restaurants such as Café Thai, Läderach, Mon Petit Boulanger Chéri and Services like photo on go by Pronto Phot. Open times are usually: Monday - Friday: 8:30 - 19:00; Saturday: 8:30 - 17:00. For complete list of shops see the plan of Cornavin Metro Shopping. Raiffeisen and Post Finance ATMs as well as Western Union. Many automatic ticket machines. Free internet after registration is at the northern west exit from the station (uphill), by the Ticket Office. Escalators and Lifts - handicap friendly station. Lockers and sitting places are located at the train platforms. 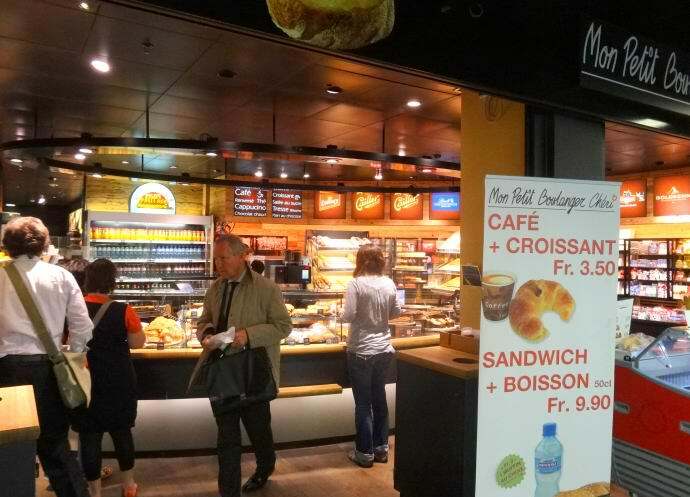 Cafe Ritazza is open 7/7 6-22 with French bread prices starting around 6.40 CHF for medium size and 8.50 CHF big size, espresso coffee prices starting at 3.60 CHF, beer 3.90 CHF. Also Subway, Starbucks or Migros grocery shop for simple snacks. If You leave the Train Station and walk down the Rue de Mont Blanc, on the left side you find a Starbucks with free wifi and on the right site you have Cite Cambio Exchange with good currency exchange rates. Further down the street is Raiffeisen, Swatch, Sushi Bento Bar, Kebab Istanbul, Boreal Coffee Shop, O.Zbinden mod's hair. Mcdonald's etc. Exiting the train station on it's lower floor, towards the lake (going downhill, there is Starbucks on the left), you find yourself on Rou du Mont-Blanc, where at number 18 is located main tourist information center and the main post office in the same building, happy to help you to get oriented.